Author Kendell Foster Crossen (writing as Richard Foster) was editing “Detective Fiction Weekly” in 1939 when he was asked to compete with the successful “The Shadow”, who's prominence began in 1931. By 1939, lots of publishing companies were attempting to cash in on the craze (“Centaur's Amazing Man”, “The Black Bat”), and Crossen was chosen to do so. Originally deeming him “The Gray Lama”, more vibrant, colorful artwork was requested and “Gray” became “Green”. 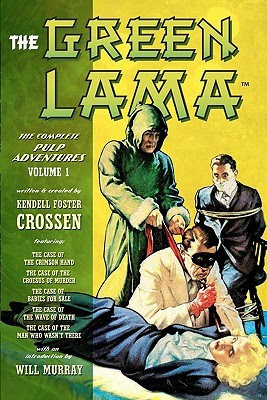 The very first 'Green Lama' story, “The Case of the Crimson Hand”, appeared in “Double Detective” in April, 1940. Crossen named his hero Jethro Dumont, a Harvard graduate with a Ph.D. in “oriental religions”. He inherits ten million, and then travels to China to study Buddhism. Miraculously, these studies allow Dumont to acquire a host of crime-fighting tricks and techniques that he carries back to New York to become THE GREEN LAMA. Dumont walks around in the daylight as Reverend Dr. Pali, and at night dons a green robe and hood, a red scarf and a ton of luck to become a vigilante. The Green Lama operates out of a penthouse laboratory and has a Tibetan servant named Tsarong. He also has an ally in the now reformed mobster Gary Brown. “The Case of the Crimson Hand” is a familiar one. An evil villain named The Crimson Hand has stolen a handful of Dr. Valco's deadly capsules. These capsules contain a lethal dose of radium that will wipe out a cubic mile of the population. The Crimson Hand and his squad of goons plan on releasing all of the capsules in major cities, thus killing off the population and making room for him to become...you guessed it...the ruler of the world. This short novella displays The Green Lama in all of his various techniques: he can touch a face and cause instant paralysis. He can hide in plain sight. He can choke but not kill with his handy red scarf. He can survive plane crashes, bombs, bullets and beatings, but he isn't immortal. He has a magic catchphrase of “Om! Ma-ni pad-me Hum! Om! Ma-ni pad-me Hum!”. I don't know what this does...but he says it a lot. Essentially, The Green Lama just goes from hideout to hideout routing out the bad guys, stopping their evil plans and putting The Crimson Hand behind bars. Lama teams with both Gary Brown and the secret, behind the scenes operative named Magga, the mysterious lady from Lhasa. Collectively, they're rough and tumbling through 90-pages of pulp action mayhem. It is pulp for the pulp enthusiast, and in that regard fans and readers should have a great time. Altus Press has this story included in their 2013 release “The Green Lama: The Complete Pulp Adventures Volume 1”. Along with this story is “The Case of the Croesus of Murder”, “The Case of Babies for Sale”, The Case of the Wave of Death”, “The Case of the Man Who Wasn't There”, “The Case of the Death's Head Face” and “The Case of the Clown That Laughed”. The stories are prefaced by author Will Murray's introduction and professional commentary. Altus Press has a total of three volumes encompassing 16 total stories.